Hummingbirds, bees, butterflies and other pollinating insects are important to your vegetable garden. Many crops such as squash, cucumber, tomato and eggplant won’t produce fruit or seeds without their help. These beneficial critters transfer pollen from the male part of a flower to the female part of a flower, resulting in the formation of vegetables. Bees are the most important pollinators because they spend their life collecting pollen. According to the California Master Gardener Handbook, bees are responsible for one out of every three bites of food we eat. In addition, attracting pollinators also encourages other beneficial insects that can help control pests in your garden. * Install a wide variety of plants that bloom at different times of the year with several species blooming at once. Pollinators are active at different times of year. In our yard, the bees gather at the blooming rosemary plants during the winter, when little else is flowering. * Plant in clumps, perhaps three feet by three feet. Bunches of flowers of the same variety in the same area are more attractive to pollinators than single flowers. * Include flowers of different shapes and colors. Bees are particularly attracted to flowers that are violet, blue, purple, white or yellow. Butterflies prefer bright red or purple. Again, plant in clumps. * Choose natives. 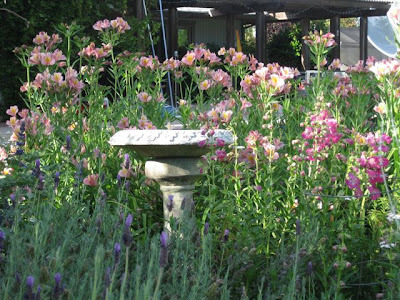 Many California pollinators prefer native plants. * Plant non-hybrid flowers. Many hybrids have had their pollen, nectar or fragrance bred out of them, making them less attractive to pollinators. * Eliminate or limit pesticides whenever possible. Pesticides can be harmful to pollinators. When a pesticide is needed, use the least toxic one. * Provide nesting sites and food sources, such as nectar for hummingbird feeders and salt licks for butterflies. 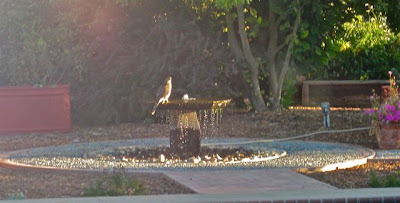 * Pollinators need water, too. A bird bath or fountain is ideal. Some garden references may advise you to cut off flower heads to enhance the beauty of the foliage plant (such as for lamb's ears). If your goal is to attract garden good guys, let those flower heads stay. Finding plants to attract bees in the spring and summer is easy. 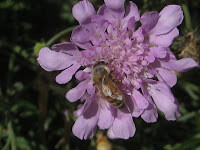 Besides the plants listed above, the University of California's Urban Bee Garden has an exhaustive list of spring and summer blooming plants that will bring out the bees, especially the native bees. Be advised: the plants on that list were chosen based on their performance in the San Francisco Bay Area. Here in the valley and low foothills, the list might be a bit smaller. But go ahead, try 'em all, and see which ones make it! 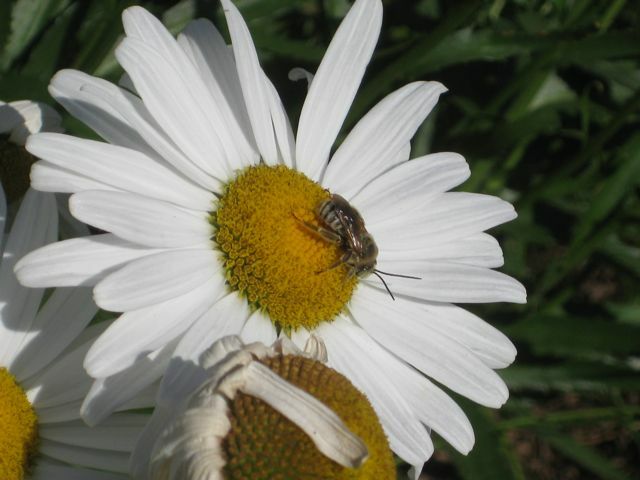 That Urban Bee Garden website has tips for making your yard more attractive to native bees. The real trick for gardeners: getting bees to spend the "off-season" at your place. Many native bees hibernate in the winter; honey bees, however, can work year round, weather permitting...as long as they have sources for pollen and nectar. Here in the valley, these plants tend to keep their blooms, and the honey bees, during the fall and winter. * Although English Ivy is part of UC Berkeley's "Flowering plant species and their relative attraction to honey bees and native California bees in Albany and N. Berkeley" list, it is considered an invasive plant by the California Invasive Plant Council. English ivy is a threat to coastal forests and riparian areas. Farmer Fred, I am surprised that you listed English Ivy as a recommended plant to attract bees! Their bee attraction is news to me. I eradicated English ivy from my property and I will be the first to discourage anyone to plant it in their gardens. I think you ought to reconsider this recommendation. Fortunately,for those of us that consider ivy to be more of a nuisance. there are other plants that can be used instead. I'm in the process of finishing up a powerpoint on "beneficials of the home garden" that I will be presenting tomorrow to the Organic Garden Club in Carmichael. I wanted to recommend a short list of bee friendly plants that can be used in the garden to enhance natural enemies. I will certainly NOT recommend English Ivy as it would be irresponsible for me to recommend an exotic invasive weed just because it is attractive to honey bees. Oh! Those flowers caught my attention. It seems you have a great flower gardens. How I wish I could have a cool garden like yours. Keep it up! You Have a Lot of (Oak) Gall! After the Harvest, Where Do You Store It?